Today in Masonic History Augustus Le Plongeon is born in 1825. Augustus Le Plongeon was a British-American photographer and antiquarian. Le Plongeon was born on the island of Jersey off the coast of Normandy, France on May 4th, 1825. At the age of 19 he sailed to South America and was shipwrecked off the coast of Chile. He would settle in the Valparaiso, a major city and sea port in Chile. While there he would teach at a local college. In 1849, he sailed for San Francisco to participate in the California Gold Rush as a surveyor. As a surveyor during the Gold Rush he laid out the plans for Maryville, California. He would also apprentice to become a doctor of medicine. In 1851, Le Plongeon would return to England where he would study photography. Returning to San Francisco in 1855, he would open a portrait studio on Clay Street. In 1862, he traveled to Lima, Peru to open another portrait studio and to start a medical clinic specializing in new alternative medicines that were popular at the time. Le Plongeon	pioneered the use of photography in his studies. As he traveled around Peru he documented everything he saw. Over eight years he extensively photographed ancient ruins around Peru. In 1870, Le Plongeon returned to San Francisco and gave several lectures at the California Academy of Sciences about Peruvian archaeology and the causes of Earthquakes. He would travel through New York giving lectures in 1871 as he headed back to London. In London, Le Plongeon studied mesoamerican manuscripts at the British Museum. He would also study the works of Charles Étienne Brasseur de Bourbourg, a French scholar. It was these two events that led Le Plongeon to the conclusion that the cradle of civilization was actually in the New World. Essentially, Le Plongeon's theory went that human civilization began in the Americas and made it's way to Egypt via the lost continent of Atlantis. Also while he was in London he would be meet the woman he would collaborate with the rest of his life, Alice Dixon. The two married on their return to New York. In 1873, Le Plongeon, with Alice, traveled to the Yucatán and would remain there until 1885. Le Plongeon was inspired by his contemporary, Heinrich Schliemann who discovered the city of Troy. Le Plongeon felt that descriptions of Atlantis that were written by Plato would lead to many other mythical locations. Le Plongeon and Alice photographed everything they encountered, from small figurines which they coined the name "Chaacmol" it would later be discovered that the use of the word was incorrect, for decades after though the name Chaacmol would be used to describe that type of figurine. While in the Yucatán, Le Plongeon attempted a translation of Troano codex. The translation at the time was not well received and it turned out that the translation was completely in accurate. Le Plongeon essentially made the text state what he wanted and even put in a section that seemed to detail the destruction of Atlantis. By the 1880's most mainstream Mayan archaeologist had accepted that the Mayan culture postdated the Egyptian. Le Plongeon stuck to his theories. He also made the claim that Freemasonry could be traced back to the Mayans and claimed that he knowledge of Freemasonry had passed through Atlantis to Egypt. He also wrote about a Mayan Queen and her Prince and how she honored him with a ceremony and a monument. The story was very similar to how Queen Victoria had honored Prince Albert. Although Le Plongeon's theories have long since been discredited, his photographic documentation of the Yucatán was an important contribution to American archaeology. Le Plongeon passed away in Brooklyn, New York on December 13th, 1908. Le Plongeon has been documented many times as a Freemasonry from different sources. Although his actual lodge membership is not available. 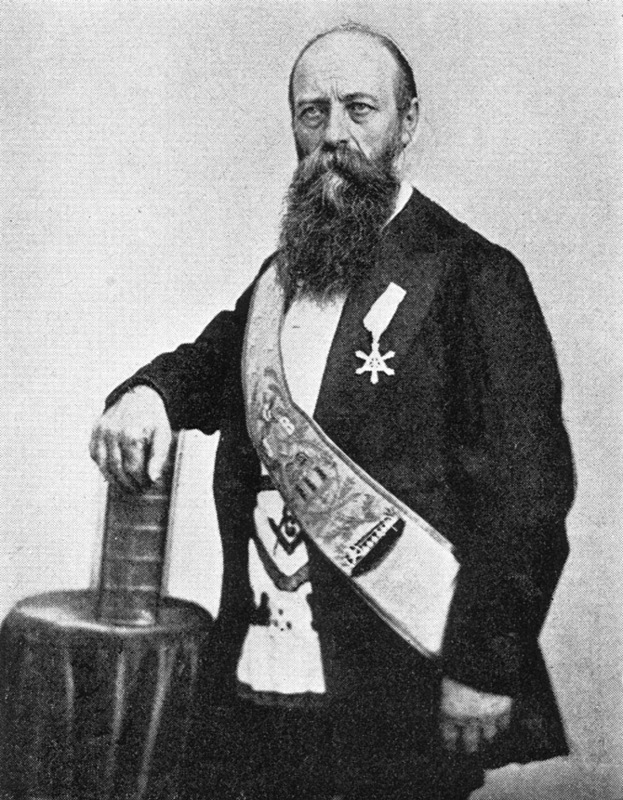 He was also photographed in full masonic regalia.